When a new automobile hits the market, it’s common to see it on the cover of all of the major car magazines, often all in the same month. Of course that’s the press doing their job, but what has become of the latest BMW or Corvette a season later? Our generally Fox Terrier – like society has moved on to the newest shiny, bouncy thing, with last months toy relegated to has been status. It’s often the same thing in the audio industry, with consumers caught up on whatever is moving and shaking; losing track of solid products. 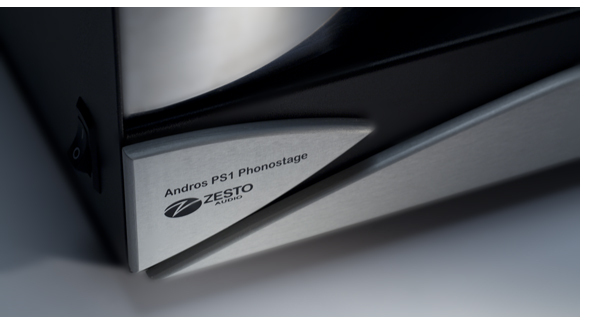 The Zesto Andros PS1 continues to maintain high excitement among audiophiles at hifi shows around the world since its introduction last year, remaining a topic of discussion on any number of audio forums, with nary a complaint – no small feat in today’s interconnected world. Designer George Counnas and his wife Carolyn have been buried filling orders on the Andros PS1, George has managed to find the time to develop a linestage as well, the Leto. 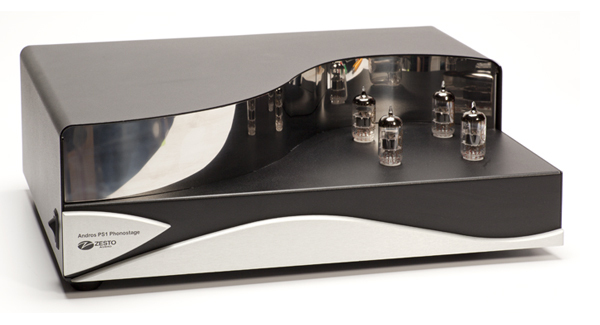 We’ll cover that another time, but for now it’s time to take another look at this phono stage. A lifelong music and audio enthusiast, Counnas began his career working for Decca Navigator in England, designing navigational systems for the Royal Air Force. He’s taken those years of experience full circle to his initial passion, hifi. The Andros PS1 follows in the tradition of some of the best classic tube circuits utilizing four 12AX7s to get the job done, along with step up transformers to provide additional gain in the MC stage. In MM mode, the Andros PS1 offers 45db of gain, 65db in the MC mode, with adjustable loading from 20 ohms to 1000 ohms. With an MSRP of $4,300, the Andros PS1 is a few steps beyond the journeyman enthusiast. Even those with a table/arm/cartridge combination in the $1,000 – $2,000 range will find the PS1 provides a substantial step up in performance, but the PS1 really comes into its own coupled to a better source. 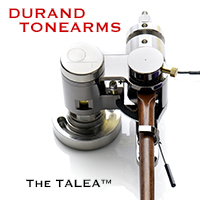 For this review, three turntable combinations were used, all with excellent results. A wonderfully clean, albeit stock Thorens TD-124 along with an SME 3009 tonearm (carefully restored by Alfred Kayser at smetonearms.com) sporting a NOS Ortofon VMS20 mk.2 MM cartridge, A VPI Classic 1 table with VPI arm and the Ortofon Cadenza Bronze cartridge, and AMG’s V-12 turntable, 12” tonearm and the Lyra Kleos cartridge. A number of other cartridges were tried with various gain and loading requirements to see if a curve could be thrown to the Andros PS1. It performed without issue using cartridges having outputs from .23mv to .6mv. 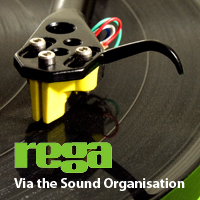 Thanks to the 20-ohm setting, the Andros PS1 works particularly well with the Rega Apheta MC cartridge, which doesn’t always play well with others, but when the right combination is achieved turns in a brilliant performance. The Andros PS1 is one of the few phonostages that can tame this great MC cartridge. One other very cool feature that the Andros PS1 offers is the ability to float the ground via a switch. If you’ve ever been vexed by hum in your phono section, this thoughtful feature will set you free. Instead of talking tech forever, let’s play records instead. Zesto puts 50 hours on each unit before they ship, a boon to the anxious audiophile. Sounding inviting straight from the box, the Andros PS1 opens up somewhat after another 50 hours, but the delta between initial turn on and down the road isn’t dramatic. By the time the first few albums had spun, I knew it would not be going back to the manufacturer when the review was finished. There are some amazing phonostages up around the $10,000 level, but there aren’t many amazing units available at the $4,000 range. Highly competent, yes, exciting – no. The Andros PS1is a very exciting phonostage. Elvis Costello’s Imperial Bedroom just arrived from Mobile Fidelity at the beginning of this review and even with the Thorens/Ortofon combination it is easy to discern between the two pressings, taking advantage of the additional clarity present on the remaster. Ok, one quick geek moment. As good as this phonostage sounds as shipped, spend another couple hundred bucks on a better set of 12AX7’s and you will be greatly rewarded. Switching from the stock JJ’s to a set of EAT tubes rocks the Andros PS1 to an entirely new level of performance, with a major leap in dynamics and an even quieter background. The slight bit of HF etch at turn on disappeared with the installation of the EAT tubes, bestowing even more value on the Andros PS1. Mind you, it does take about 90 minutes to fully stabilize, which seems to be more common among 12AX7 designs than those based on the 6H30, and both have their own unique sonic signature. You either dig the 12AX7 sound or you don’t. 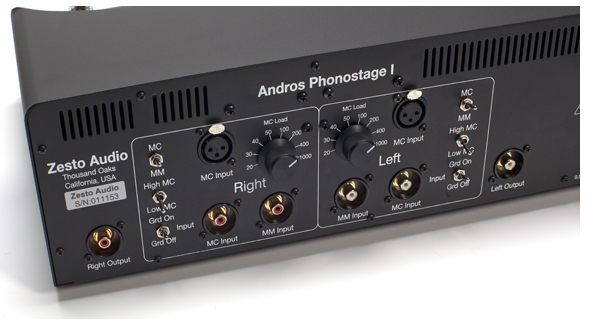 Where solid state phonostages seem to come out of a fog over the first few hours, the Andros PS1 starts with a somewhat small soundstage that just keeps getting bigger with time as it warms up. The Andros PS1 has a tonal correctness that becomes more evident as the hours go by. There is a sense of flow, with notes flowing up and out of the presentation, distinctly rendered. Oboes sound like oboes, not squawky and violins sound natural, not squeaky or harsh. 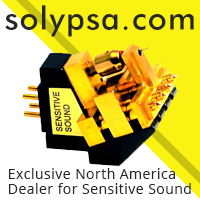 The soundfield produced by this phonostage is humungous and it helps to make the speakers disappear that much easier. Compared to the other two exceptional phonostages in this neighborhood, the ARC PH6 and the Pass XP-15, the Zesto does not have the ultimate quiet of the ARC or the slam of the Pass, but neither possesses the flow of the Andros PS1 and this is its charm. Each of these phonostages will appeal to a different listener and offer top synergy in a different system. What is given up in terms of precise placement across the soundstage, is returned in depth and clarity. The Stanley Clarke Trio’s recent release, Jazz in the Garden shows off the individual talents of Hiromi on piano, Lenny White on drums and Clarke on bass. The record is very sparse, with each musician occupying plenty of space. White’s drumming on the first cut, “Paradigm Shift” is mostly light cymbal work. The Andros PS1 renders fine tonal gradation, with the cymbals decaying into nothingness gradually, with no truncation in even the quietest sounds. All this while Hiromi’s piano gently floats off in the distance, well behind the speakers, moving right up front as she takes prominence, then fading back again. The result is highly convincing. The textures revealed push the Andros PS1 into “excellent” territory. You can feel Clarke’s fingers slide up the neck – this is not one note bass, or the least bit warm and slow. For this reviewer, the Andros PS1 possesses that perfect mix of air, texture and tonality; retaining resolution without ever being harsh, with a tonal richness that doesn’t get muddy or lacking in pace. Dense recordings prove easy for the Andros PS1, another area where lesser phonostages fall down. Queen’s News of the World is fairly compressed and overmodulated throughout, keeping Freddie Mercury’s lead vocal out in front of the mix instead of being trapped in the huge ball of sound that is Queen. 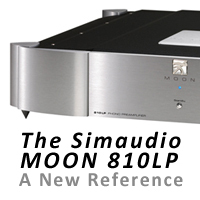 Comparing the Andros PS1 to a few higher priced phonostages (the ARC REF Phono 2, Pass XP-25 and Sim 810LP) and a few lower (Manley Chinook, EAR 834P and Sim 310LP) reinforce that the pricing of this unit is indeed spot on. Even the class leading Manley doesn’t extract the amount of information from a record that the Andros PS1 can portray. 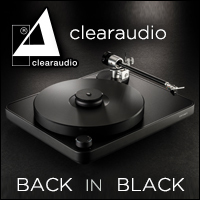 Using a pair of identical AVID Volvere SP turntables, both with matching Dynavector DV-20X2l cartridges and SME 309 tonearms makes the comparisons a snap. As it does moving upscale. The Andros PS1 is a well-executed product that is intelligently priced. And mighty nice to look at on the equipment rack as well – it’s obvious that a lot of care went into its construction. Sampling a wide range of cartridges proved exciting. Thanks to a high/low output MC switch, everything from the .23mv Miyajima Kansui to the .6mv Lyra Kleos, nothing proved an obstacle. While a handful of phonostages in the $800 – $1,500 range are more heavily weighted to be MM, with the MC stage more an afterthought, the exact opposite is often true with big buck phonostages. Conventional wisdom is that someone running a big dog phono stage is automatically running an equally spendy MC cartridge, yet the Andros PS1 takes no prisoners with its MM performance. If you have easy access to the rear panel of the Andros PS1 in your rack, you can run one turntable with a MM cartridge in the MM input and another with MC in the MC input, using the rear panel switch to choose between them. Which is precisely what I did, bringing the newly acquired Thorens TD-124/SME3009 combination into the mix. The SMEs removable headshell allowed easy cartridge swaps and the NOS Ortofon VMS 20Mk. 2 (usually found for about $100) and the $1,100 Clearaudio Virtuoso Wood both turned in stellar performances. The combination of the idler table and the VMS 20mk.2 made for an explosive rendition of many of my favorites from the early 70s. After a solid month of intense audition, the Zesto Andros PS1 exhibits no weaknesses whatsoever. While it has a beautiful visual aesthetic, it continues to be a joy to listen to and is ultimately musical. With many audiophiles on a quest for gear that is increasingly more resolving, it might be easy to overlook the Andros PS1, but truly wise LP lovers will treasure the Zesto because the balance is just right. Much like a car with perfect 50/50 weight balance, along with equal amounts of stop and go, the Andros PS1 doesn’t maximize any one parameter at the sake of another and that is its magic. Selfishly, the only change I’d make to this phonostage if I ran the show would be to move the MM/MC switch to the front panel, but I’m guessing the rear panel placement is due to signal path optimization. Only a minor nit to pick. This one is the teachers pet in the under $5,000 category. Very enthusiastically suggested.